Six custom–designed drivers with dedicated digital amplifiers. Pure, vibrant sound with rich deep bass; the Sonos PLAY:5 All–In–One Hi–Fi Speaker System is nothing short of spectacular. Three tweeters, three mid–woofers, and six custom–designed drivers individually coupled with dedicated, state–of–the–art, Class–D amplifiers do more than produce great sound, they fill your entire room with detail and clarity that lets you hear every song exactly as the artist intended. Crafted to effortlessly reproduce HD sound from HD and Blu–ray movies, pair two PLAY:5 speakers together for wide, stereo sound, or create a 5.1 channel home theater system by adding a PLAYBAR and SUB to your paired speakers for a surround sound experience that will blow your hair back. Trueplay smart technology analyzes the room and the location of your PLAY:5 in that room, noting things like furnishings, size and layout of the room and acoustics, and automatically tunes your system for the absolute best sound possible. Or you can tune the system yourself with adjustable bass and treble controls for audio that meets your personal preferences. Enjoy free access to over 100,000 pre–loaded internet radio stations without the need for a computer, log in to your favorite music services like Spotify®, Pandora®, Amazon Music, SiriusXM™ and more, or stream personal playlists from devices on your home network. Once the music is playing, simply tap the top of the unit for volume up/down, and swipe for next/previous track, or use your smartphone, tablet or PC for total control of the sytem. The PLAY:5 is humidity resistant so you can take it in the bathroom while you shower, but don’t submerge it or get it wet, the PLAY:5 is not waterproof or water resistant. Available in black or white, the Black Sonos PLAY:5 features sleek, modern lines with gently rounded corners and an elegant presence. Enjoy your favorite songs from iTunes. Stream your favorite online music services. Play a different song in each room at the same time. Or one great tune all over the house. With Sonos, everyone enjoys the music they love most, in any room they wish. Enjoy your favorite songs from iTunes and personal library. Stream Apple music or your other online music services with the Sonos PLAY:5 Wireless Speaker. Listen to over 100,000 free pre–loaded local and international radio stations. Plus the world’s best new music on Beats 1, broadcasting live from LA, NY, and London. Songs and playlists handpicked just for you by Apple Music experts. All delivered out loud on a room–by–room basis Get just about every song ever recorded—and the experts to recommend the right ones for you based on what you already listen to and love. The PLAY:5 Black couples six state–of the–art digital amplifiers with each of the six speakers to deliver phenomenal sound to any room. Every note played and sung is excellently voiced by the wireless streaming speaker purely and with the precision of larger speakers. With remarkably distinct clarity and zero audible distortion. Even when you crank it up loud, really loud. Listening to your music in true stereo can be achieved by syncing your PLAY:5s via the free control app. Simply select the two PLAY:5s from the speakers available in the app list, and turn each into separate left and right channel speakers to create wider, bigger, and deeper sound. You can even bolster your home theater experience by adding two PLAY:5 Black speakers to a PLAYBAR and SUB for a true surround sound. All filter settings, active equalization and time–alignment are done in the digital domain through state–of–the–art DSP circuitry so there's absolutely no loss of audio quality or acousitc energy. No bit of your music will be left behind. Have you ever listened to a speaker in the showroom only to have it sound wildly different in your listening area. Sonos; Trueplay uses your iPhone® or iPad® to measure the acoustics in any room. Actively using the microphone from your smart device and analyzing things like size, layout and furnishings. Then fine–tunes your PLAY:5 Black to make the music sound great, no matter where you place your speaker. With a massive library of over 100,000 free radio stations, shows and podcast available for free, the hardest decision will be what to start listening to. Tune in or browse for stations or type the call letters of your favorite stations without turning on your computer. You can also acess your premium and subscription services. Sonos works seamlessly with Amazon Music, Deezer, iHeartRadio, JB Hi–Fi NOW, JUKE, Pandora®, Rdio®, Rhapsody®, SiriusXM™, Slacker® Radio, Songza, Spotify®, Stitcher SmartRadio™, Radio by TuneIn, Concert Vault, WiMP, and downloads from any service offering DRM–free tracks. *Service availability varies by region. Play music stored on up to 16 devices in any combination of PCs, Macs or Network Attached Storage (NAS) drives on your home network. The wireless speaker supports the most popular audio formats, from iTunes® to MP3. 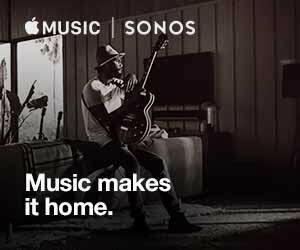 Sonos wirelessly plays all of your iTunes® music, directly from your iPhone®, iPad® or iPod touch®. Move freely without worrying about wires to any room in your home and enjoy your favorite playlist roaming from the kitchen to the bedroom seamlessly. When wirelessly connected to a BRIDGE, BOOST or another player, you can use the Ethernet port on the back of your PLAY:5 Black to bring standard Internet connectivity to your set–top box, DVR, PC, game console or network hard drive. The PLAY:5’s touch interface is a simple, convenient way to control your music right from the speaker. Just tap for volume up/down and swipe for next/previous track. Place the PLAY:5 Black on any kind of surface in your home without fear of scratches or scrapes. Designed to withstand high humidity, such as in a bathroom with a running shower. No matter how tempting, the PLAY:5 Black is not waterproof or water resistant and should not bathe or swim with you. The only warm or cool fluid it enjoys is the audio eminating from your carefully curated playlists. Control all your music and rooms with your Android™ device, iPhone®, iPod touch®, and iPad™. Free Sonos Controller apps for Android, iPhone and iPad let you control your Sonos players, music on the Internet and your computer right from the palm of your hand. Download the apps for free on the iTunes App Store or Google Play™. The PLAY:5 Black can go anywhere, delivering music to any room in your house, wirelessly. Players and Controllers establish their own secure wireless mesh network that delivers the extensive range and superior performance you need to get music all over your house. Amplifier: Six Class–D digital amplifiers perfectly tuned to match the speakers and acoustic architecture. Tweeters: Three tweeters create a crisp and accurate high–frequency response. Mid–woofers: Three dedicated mid–woofers ensure the faithful reproduction of mid–range frequencies crucial for accurate playback of vocals and instruments, while also delivering a deep, rich bass. 5.1 Home Theater: Add two PLAY:5 Black speakers to a PLAYBAR and SUB for a true surround sound experience. Note: Apple "Fairplay", WMA DRM and WMA Lossless formats not currently supported. Previously purchased Apple "Fairplay" DRM–protected songs may be upgraded. Music services supported: Sonos works seamlessly with most music services, including Pandora, Spotify, Deezer and Soundcloud. For a complete list see http://www.sonos.com/streaming–music. Apple AirPlay music sources: Connect an Apple AirPlay music source, such as an Apple AirPort Expres, to any Sonos player with line–in. Enjoy songs from your iPhone, iPad or iPod touch in any or every room of the home. Status Indicator: Light indicates PLAY:5 Black status.